Prints are bold and they can take your outfit to the next level but like any fashion trends, there's a few ways to make sure you wear prints in the most effective way. Some patterns will compliment, where others will clash... but don't go sticking to block colours out of fear though! With patterns you’ll want to focus on complimenting colours, sizes and the idea that less-is-more. If you’re not used to wearing prints (like me), ease them in to your look by wearing them with solid colour clothing. 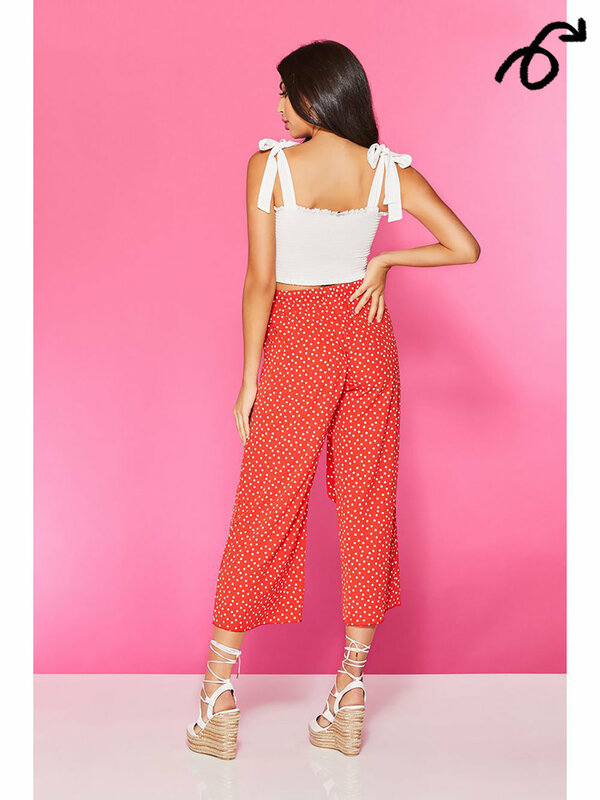 For something cool and stylish, match a pair of polka dot palazzo trousers with a plain white crew neck and barely-there sandals to channel summer vibes. OR tuck a pastel ruffle shirt into a horizontal-striped A-line skirt for an on-trend look that’s suitable for work or play. Similarly, you can tone down a loud pattern by layering a monotone blazer or fitted jacket over the top. To add an edge of style and print to your wardrobe, consider wearing patterned accessories such as bags, bandanas and belts. You can also pick out a colour from a pattern and use that to match it with other garments. A floral print that has elements of pink in the pattern is enhanced by a solid coloured jacket that is the same colour of print. If you want to go for two printed garments, keep your fabrics in the same colour family or pick two stylish prints that share a single colour. This ensures that your outfit doesn’t clash and is a safe way of mixing and matching prints. If you’re feeling a little more daring, you can try wearing two different patterns in your outfit. Try breaking mixed prints up with a neutral garment — channel boho vibes with a paisley co-ord jacket and skirt and separate the patterns with a neutral cami top. Or separate polka dot pumps and a patterned jacket with plain trousers. Similarly, you can also split up clashing prints with a chunky belt and cross-body bag. There’s also the options of wearing multiple items with the same print on. One good way to do this is to invert the colours if you’re using two of the same pattern. For example, if a white cami with navy checks would pair well with a navy cami with white checks. You can also wear the same pattern together with in a larger or smaller scale. Try pairing a high-waisted pair of slacks with a strappy top that’s a smaller version of the pattern. Consider your jewellery in the mix too — if you’re wearing a geometric printed top, opt for jewellery of the same pattern! Try to stay within one colour scheme or your outfit will look a little bit jumbled. Stick to one colour family and use it throughout the full outfit — this helps your individual garments complement each other and prevents an outfit that appears to have been thrown together! Animal prints can look fierce but they have a hard time matching with different animal prints. For this reason, pair animal prints with solid coloured pieces — try a leopard print cami dress with a black t-shirt underneath along with black heeled ankle boots. Here, the solid coloured top and boots will match with the spots, whereas pairing it with a leopard print shoes would have been too much. Got those tips down? You’re all set to flaunt those prints! The main thing to remember is to wear what you feel confident in and have fun with fashion!